Overview: The Quakers' Connor Nisbet will one one of the contenders for the individual title. Comments: The Quaker's intentions are a little unclear since they do not appear on the meet roster, but Connor Nisbet's aim is to win Eastern States after finishing 2nd in the D race last year. Overview: The Warriors will be trying to come up for a top 10 place. Comments: Liverpool is an always dangerous team, and with a relatively nice compression, the Warriors could move well into the top 10. Overview: The Vikings are one one of the top 25 teams in PA and could be moving up for a top 20 spot. Comments: The Vikings had a solid performance at Carlisle which should help them with the much bigger field in Eastern States. Overview: The Wolfpack flies in as the #3 team in CA and will be among seven top contenders for the Eastern States title after winning the Stanford Invite. Comments: Claremont will be helped by its tight compression in the back hills of VCP on a hard packed course with a surface similar to those out west. Overview: Took second at the Great American Festival behind Loudoun Valley, with just over 100 points. Comments: Charles Hicks is the top guy back from last year's ES when he finished 5th, and he will be the favorite coming in for an individual title. The Bulldogs could also be looking to propel themselves up into the champion's seat after a strong run at Great American. Overview: Hasn't raced an invite since early September, although had pieces of their Top 7 at the Tully Invite. Comments: The Hornets have been building their team team up without a major meet for the last five weeks, so Eastern States could be a big breakout for a team that finished 2nd in the ES and at NXN last year. Garrett Brennan and Geoff Howles could be among the favorites for the individual title. Overview: Looked strong in winning a race division at the Bowdoin Classic and will be facing state rival Bishop Hendricken in Eastern States. Comments: The US #11 Rams looked good against the regional powers while winning at Bowdoin, and Joseph Dos Reis should give them a strong presence on the lead for a finish among the top 5 teams. Overview: The Panthers will get a run among the big teams in Eastern States, while vying for the individual winner. Comments: The Panthers will be among a handful of teams battling at the back of ES. 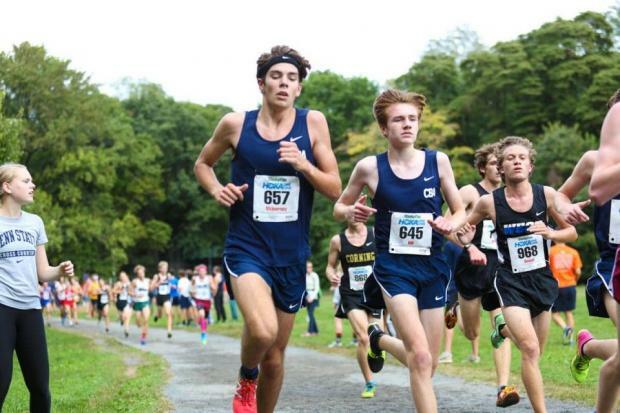 Overview: Individual Mason Gatewood popped a big performance to win Easterns last year, and now senior Matthew Payamps is in a similar situation after a few weeks at Sunken Meadow. Comments: The Friars have been hit by the injury bug again this year, so the focus is more on whether lead runner Matthew Payamps can translate his huge track performances of last year into a top place in ES after warming up last Friday with a comfortable win at St. Anthony's. Overview: The Tigers are among a slew of top 10 NJ schools battling it out at Eastern States and are poised for a top 20 place. Comments: May not have seen the full Tiger squad yet, but they will be aiming to move up on last year's 20th place in ES. Overview: No team has won as many Eastern States Titles as CBA. They looked strong in their win at the Bowdoin Classic, and have some fresh legs ready to sub in as well. Comments: Hard to say what the exact lineup will be for the deep Colts behind McInerney, Powell, and Reid, but the focus for US #18 CBA is another NXN title following their title in 2011, though a 7th Eastern States title is a good possibility for the Colts' pack attack. A full return for Troy Hill to the lineup would make the Colts the favorites at Eastern States. Overview: The Dragons are coming off a win in a NJ Shore Coaches race and could get up for a top 10 place in Eastern States. Comments: Kingsway is another of the pack of top 10 Jersey schools trying to flex their muscles at ES, and the Dragons could finish high up if they can pull up the back a little more. Overview: Took third down at Great American, just 17 points off second place. Finished 1st by a lot in the E race last year. Comments: The Hawks had a decent finish at Great American, but they really showed their power earlier at Manchester. The US #15 and top RI team could be ready to bust one here big time with a nice compression for the top 6. Overview: They put their name in the conversation for Class A State Title after taking down Burnt Hills two weeks ago at McQuaid. Comments: The Bulls used their famously tight compression to power to a 2nd place at McQuaid two weeks ago, and Eastern States should prove to be another big chance for Smithtown's pack to put itself further on the way to a Nationals bid. Overview: Took fourth up at McQuaid as a team. Comments: The two-time reigning state champion and 12th place finisher at last year's NXN took a little setback with surgery for their fourth guy, but a resilient Hawks team can be expected to be battling up among the top 7 teams in the ES. Overview: The Knights wil be getting in a run among the powers at ES. Comments: North Penn should be among a group of about five teams battling at the back. Overview: The Stanners are among the teams battling for a CHSAA championship this year. Comments: Molloy has the Loeffel brothers on the lead and the ES should set them up for a run at a high finish in the CHSAA this year. Overview: Haddonfield is ranked #2 in NJ behind CBA and #20 in the US, and it has some extra momentum after a win in a NJ Shore Coaches race. Comments: The Bulldawgs have big power at the top behind Riddel and Eisenhower and also good depth, and that usually winds up doing very well at ES, with a top 3 place a strong possibility. Overview: The Explorers are coming off a 2nd in the LaSalle Challenge race and are ranked 3rd in PA. Comments: PA's LaSalle is not rated as highly as RI's La Salle coming into the ES, but its top team compression could help it punch far above its weight in the race, maybe enough for a top 10 place. Overview: The Lions are a bit of an unknown quantity for us, but should be battling at the back. Team Data: 120? 6th in Delco. Comments: Not sure about the specifics here, but there's always room for fun in the ES. Overview: The Lions are among the wave of top 10 NJ teams that will be crashing down on the ES. Comments: Ranked #7 in NJ, the Lions have a strong enough pack to make a stab at improving on last year's 13th place finish in the ES. Overview: The Sallies are DE's top team and are making a bid to move up on last year's 11th place finish. Comments: Salesianum ran well last year as Michael Keehan took 13th, but to move up for a top 10 place, the Sallies will need to pull up the back some more behind Keehan, who returns as the second fastest finisher from last year behind Bolles' Charles Hicks. Overview: The Whippets have good momentum coming off a 1st in the Carlisle-Challenge race and are ranked 2nd in PA. Comments: Payton Sewall finished 30th last year for the 9th place Whippets in the ES last year, but a lot of the guys ahead of him have graduated, and both he and his team could be moving on up this year. Overview: The theme of top NJ teams duking it out at Eastern States continues with NJ #3 ranked Westfield which is looking strong after a 1st place finish in the NJ Shore Coaches A race. Comments: The Blue Devils had the best average time of any of the teams at the Jersey Shore meet, and with the extremely tight compression they should be fighting up among the top 7 teams in the ES.